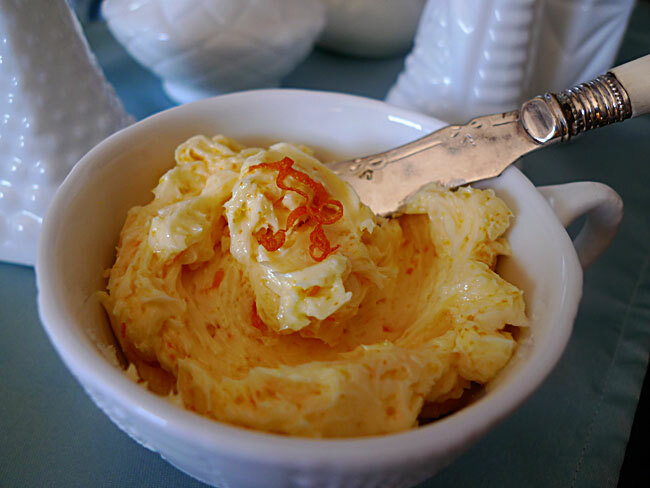 This orange butter is ridiculously simple but adds an elegant and tasty touch. Perfect on muffins or toast, and just heavenly with these chocolate chip scones. Zest a few strips of orange rind, set aside for garnish. Grate orange peel until you have 2 teaspoons. Juice orange for 1 tablespoon of juice. In a small bowl, mix grated orange peel, orange juice, sugar, and vanilla. Add softened butter, mix until thoroughly combined. Place orange butter in serving dish, garnish with reserved orange zest. Serve at room temperature.